Jean Davis Lavender is a pale pink flowered lavender with exceptionally fruity taste. Every so often we round up all the flowers of our lavenders and have a blind taste trial. Jean Davis Lavender is always the winner. The flowers are sweet instead of pungent or bitter. 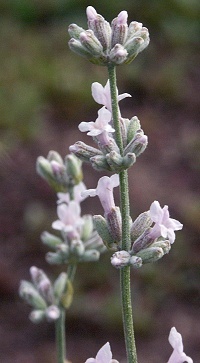 Like most Lavandula angustifolia varieties Jean Davis Lavender is a small plant that grows slowly. It can be challenging to grow in climates that have really hot summers like ours. Here we can get over 100 degrees for 30 or more days. It can be difficult to get the watering just right. Providing a bit of late afternoon shade can help. We often have to replant it every few years while the Lavandula x intermedia varieties grow well here and live a lot longer. But, no matter its challenges, we still think it is flowers make it worth the effort. This plant is often available in plug trays. These trays hold 128 of all the same plant. They are a great low cost way to fill a lot of space. Each cell is 3/4 of inch by an inch. Check here to see if Jean Davis Lavender Plug Trays are available..
Jean Davis Lavender makes a great addition to our Edible Flower Herb Garden Six Pack and our Small Space Herb Garden Six Pack.